Indium Corporation will feature metal thermal interface materials (TIMs) at Semiconductor Thermal Management and Measurement Symposium (Semi-Therm), on March 17-21 in San Jose, CA. Indium Corporation provides a wide selection of metal-based TIMs for reflow or compression. Solder preforms, which are used in a variety of applications that require precise amounts of solder. Preforms come in standard shapes, such as squares, rectangles, washers, and discs. Typical sizes range from .010” (.245mm) to 2” (50.8mm). Smaller and larger sizes, as well as custom shapes, are also available. Dimensions can be held to tight tolerances to assure volume accuracy. High-quality semiconductor grade solder ribbon, solder wire and foil manufactured by Indium Corporation are available in many standard alloys and sizes. Material can also be custom made to unique material and dimensional requirements. Semiconductor grade solder ribbon and wire are supplied in continuous lengths and are packaged on spools specifically designed for use in the manufacturing of high power devices. 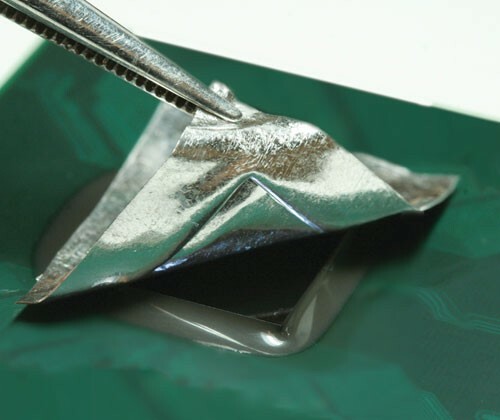 Solder foil is supplied in sheet form. Indium Corporation manufactures widths as small as .020” (.5mm) up to 3” (76mm). Thickness ranges from .001” (.025mm) up to as thick as required by the application. Our patented Heat-Spring® is a compressible interface material with 86W/mK conductivity. For more information about Indium Corporation TIMs, visit our website at www.indium.com or email tim@indium.com.